ashkitty happened to be visiting when I tried these wasabi flavoured crisps, which did very much what they said on the pack (i.e. 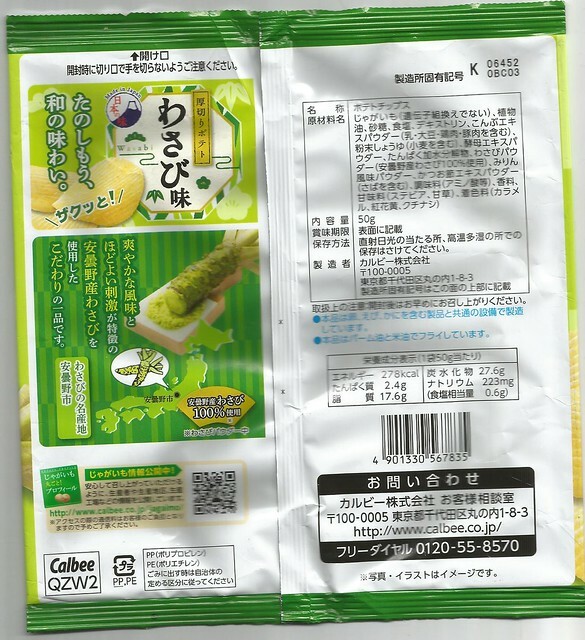 taste of wasabi) - a taste we both happen to adore. 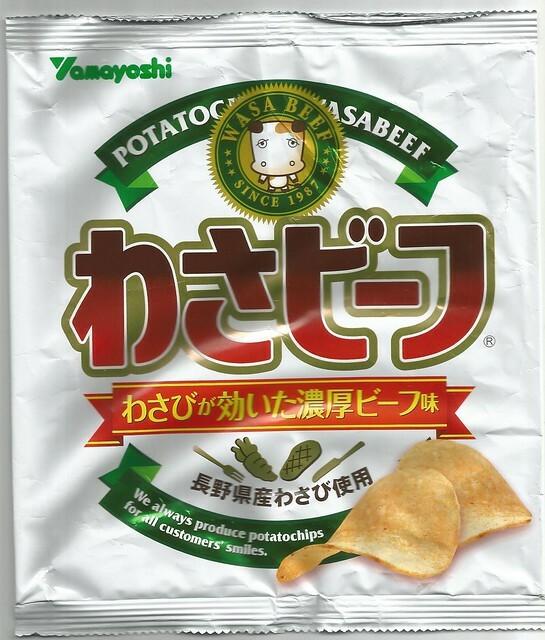 There's very little more I can say about these crisps, other than that I wish they sold them on the Gloucester Rd (where I can nevertheless buy wasabi-flavoured seaweed quite easily, so all is not lost). 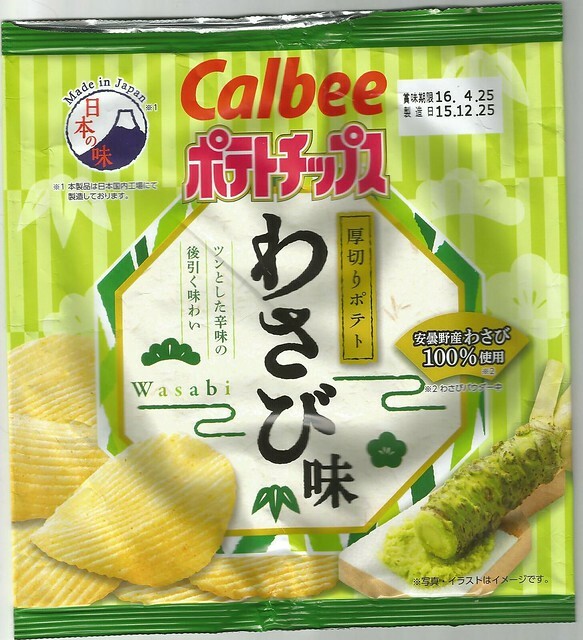 There's no way that the simple purity of that wasabi flavour could require enhancement - right? Think again: for here comes a hybrid monster, straight from the set of The Quatermass Experiment: the mighty WASABEEF! 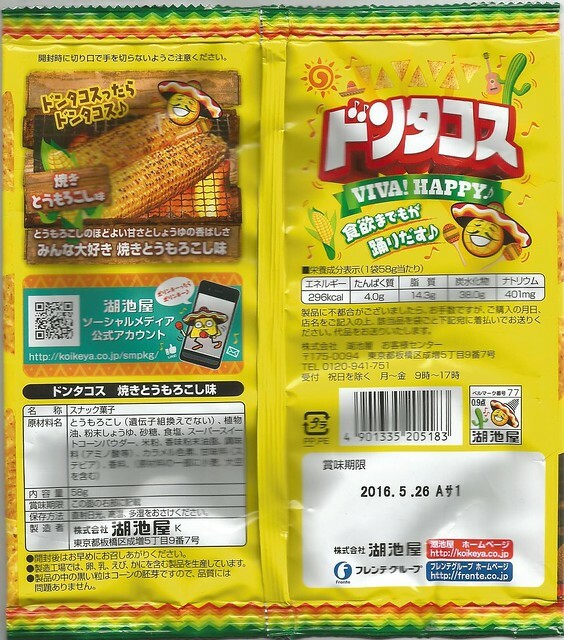 Yes, the packet is making that English pun in Japanese: "わさビーフ" uses a relatively unusual mixture of hiragana (for the "wasa") and katakana (for the beef). For the record, beef in Japanese is 牛肉 (gyuuniku), but the English word has found its way into the language via such words as ビーフバーガー (beefburger). 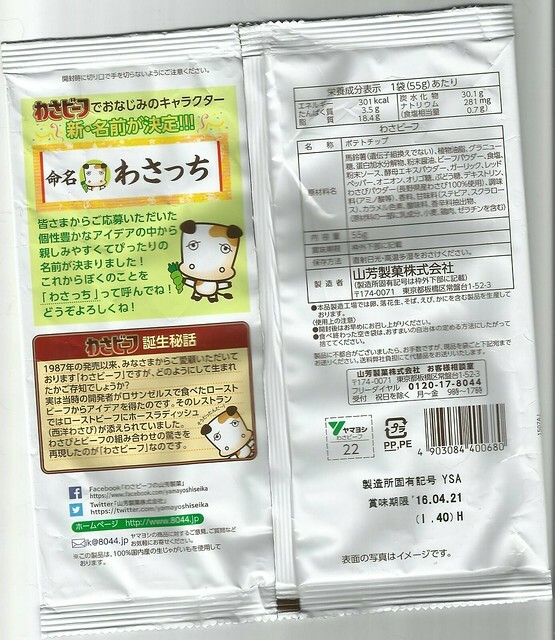 Unlike most of the creatures on these okashi packets, the cow here doesn't look particularly thrilled at the prospect of being eaten, which I find rather refreshing - and though her silent, reproachful gaze will haunt my dreams that burden is offset by the discovery that wasabi and beef work together really well. Which shouldn't be surprising, considering that horseradish sauce is a traditional accompaniment to roast beef in the UK, but somehow is. 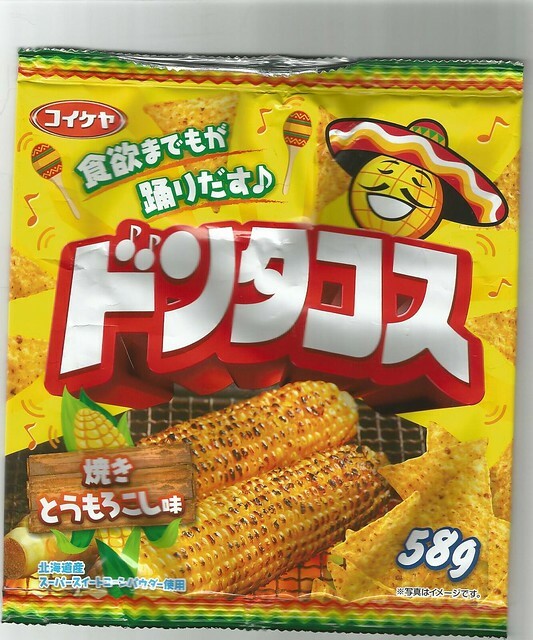 Finally for today, here are some tortilla chips, Japanese style - but just in case you wondered which country had inspired them, here is Don Tacos in his sombrero - while on the reverse we are advised, "Viva! Happy", a message I feel we can all get behind. The chips themselves were similar to tortilla chips I've had in the past - or rather, their flavour was the same, but I wonder whether perhaps they had been cooked in a different kind of oil, because there was a slightly different timbre to the taste. Okay, "timbre" is not the right word, but my gustatory vocabulary is poor - feel free to amend it. It is indeed. And here it is in real life, as grown in Hampshire. Now I know how wasabi actually looks. And what a wave must be."